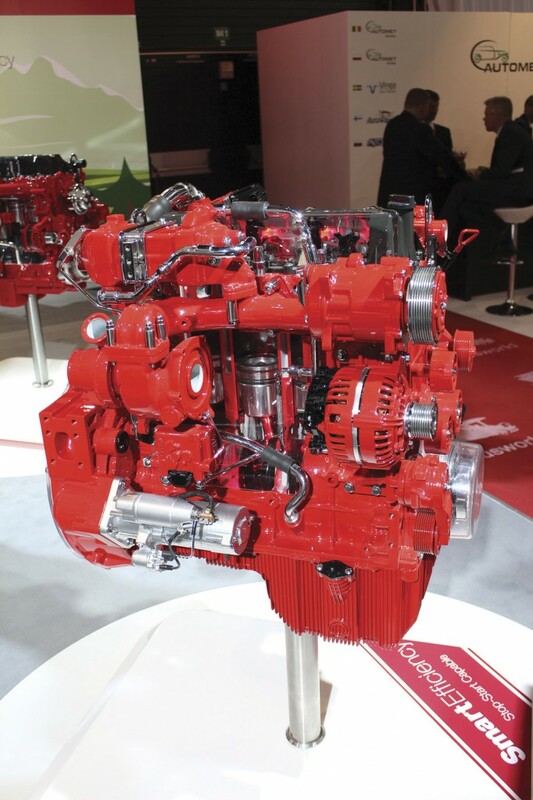 Last month we brought you details of some of Cummins’ ongoing developments (Issue 1345, 25 September 2015) but what we were unable to mention at that time, because it was embargoed, was the launch of its new stop-start system which promises to reduce fuel consumption by between 4% and 7% depending on duty cycle and cut NOx emissions by between 30% and 40%. This was unveiled at Busworld Kortrijk last week. The principle could not be much simpler: Turn the engine off when the bus isn’t going anywhere and it will use less fuel, improving overall economy and lessening emissions. The launch comes as Cummins strives to reduce TCO (total cost of ownership) for operators and learns ever more about the varied demands of different duty cycles. Regulator and consequently customer emphasis on reducing CO2 and monitoring emissions in real world conditions is now a feature of the bus market. In bringing the system to the market, Cummins recognises that the expense of hybrid systems will be more difficult for operators to justify without the assistance of subsidies in future, and also that more and more operators are familiar with the stop-start concept which is increasingly widely available on cars, though the demands in such applications are altogether different to those on a heavy duty bus. Developing the system has involved changes to the engine hardware and a great deal of software development. Among the changes are a new flywheel and ring gear, a new starter motor, a new electrical harness, new ECM calibration, a new speed sensing system, a new fuel system, new con rod bearings and new crank bearings. As well as developing these, Cummins has also had to validate alongside the new parts all of the parts that are not changing in the new set up. At the same time Cummins has worked extensively with its partners on effectively integrating the system within different applications. As a result Cummins believes the developed product is very flexible, both in terms of the ease of operation and integration. Proving the system in service has been approached very thoroughly and over 4,250,000 stop-starts will have been performed by the time of the launch. Field tests are currently under way involving eight vehicles and six manufacturers. 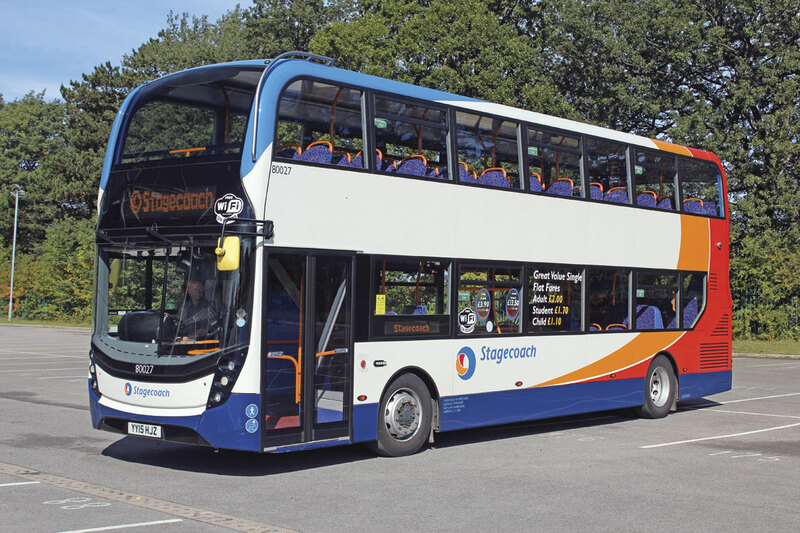 Among these is an ADL Enviro400 MMC, with 250hp engine and four-speed Voith DIWA transmission, we experienced at the pre-launch event which has been with Stagecoach since May from Gillmoss depot on Merseyside. A similar bus is running with Stagecoach in Manchester. Two of the other buses are Enviro200s with 180hp engines and Voith transmissions running for National Express. Although these prototype buses feature Voith automatic gearboxes, we were told that the system works equally well in conjunction with ZF transmissions. The initial launch fleet will be around 100 vehicles, a number of them running outside the UK, as this is not a solely UK focused development. 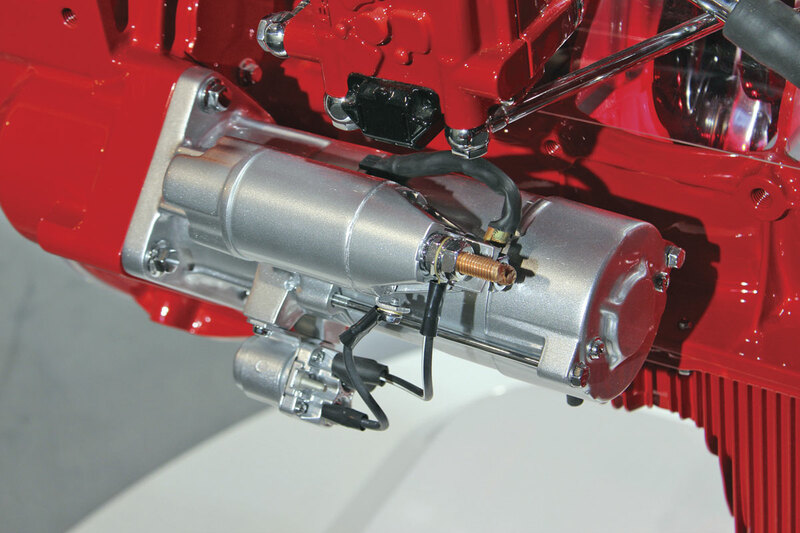 As well as bus applications, Cummins believes there is scope for stop-start in truck applications and has the equipment fitted to a truck running in its own fleet. Obviously, all of this additional starting and stopping increases the demand on the starter motor and to this end the normal unit designed for 30,000 starts has been replaced with one with a 210,000 start design capacity. In order to give members of the press an impression of how the system feels for the driver and passenger, Cummins demonstrated it in the large car parks of the Northern Echo Arena, the ground of Mowden Park Rugby Club in Darlington which was formerly home to Darlington FC. The vehicle involved was the Stagecoach ADL Enviro400 used in Liverpool. It is hard to imagine a more underwhelming experience because the system does exactly what you would expect. When you drive along it is like any other Euro6 bus and when you stop and the handbrake is applied, the engine noise immediately disappears as the engine stops. When the driver is ready to pull away, as soon as the handbrake is released the engine starts again at idle speed and the driver can apply the throttle immediately. Restarting is quick, taking less than 0.5 seconds from the brake being released. A hill-hold system ensures that the bus does not go anywhere between brake release and depressing the accelerator. To ensure that the system is always in the correct position to start quickly without waiting for cranking, there is a position sensor on the crank in the front pulley that ensures instant readiness. Clearly, the extra stopping and starting creates the potential for additional demand on the battery, and to ensure this is not excessive Cummins has initially limited the system to no more than 30 stop-start procedures in a rolling hour, an average of one stop every two minutes. If this 30 stop limit is exceeded, the engine will simply continue to run when the brake is applied. There is also a 20 second minimum restart time, so if you let the handbrake off and then reapply it within 20 seconds the engine will continue running. Sensors on the battery monitor the charge level and if it falls below a pre-determined level the engine will be restarted instantly. At this stage, the system only stops the engine when the brake is applied and not, as happens on many modern cars, when it stops in traffic. One anticipates that future developments of the system might incorporate this. The size of the batteries installed will depend on how each manufacturer wants to implement the Stop-Start technology, taking into account the number of stops and the power requirement. An orange light on the dashboard featuring an A within a circle (it looks like the old Atkinson badge) comes on when the system is in operation (that is when the brake has been applied). 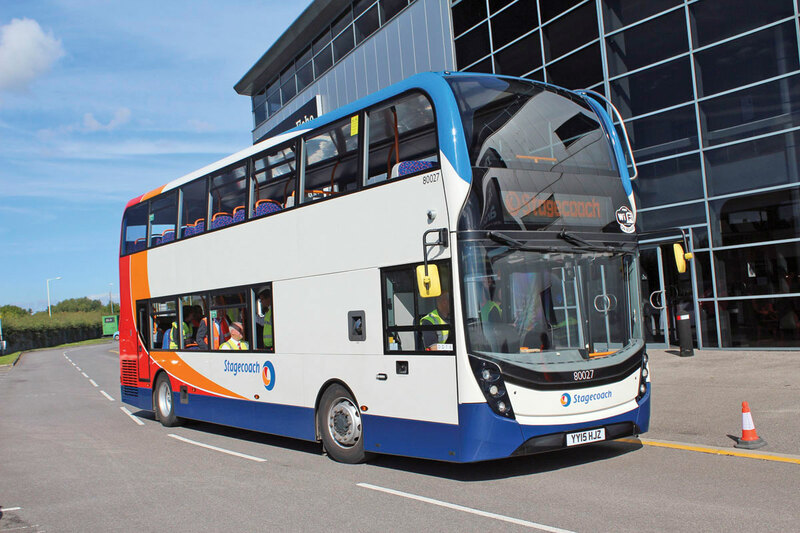 To ensure drivers are familiar with all aspects of its operation, a training programme is being rolled out across those fleets where the buses will first be operating. This will normally be accomplished by training a trainer from a depot who will impart what he has learned to the local driving force. Cummins told us that it had been well received by drivers in the live trials conducted to date. Cummins claim that the system increases passenger comfort, and in that it reduces noise and vibration at stops, as well as engine emissions in the vicinity of the bus stop environment, this is true.